It was the architect's goal to optimize the site of this North Carolina mountain artist's retreat for different groupings of visitors and family outings. 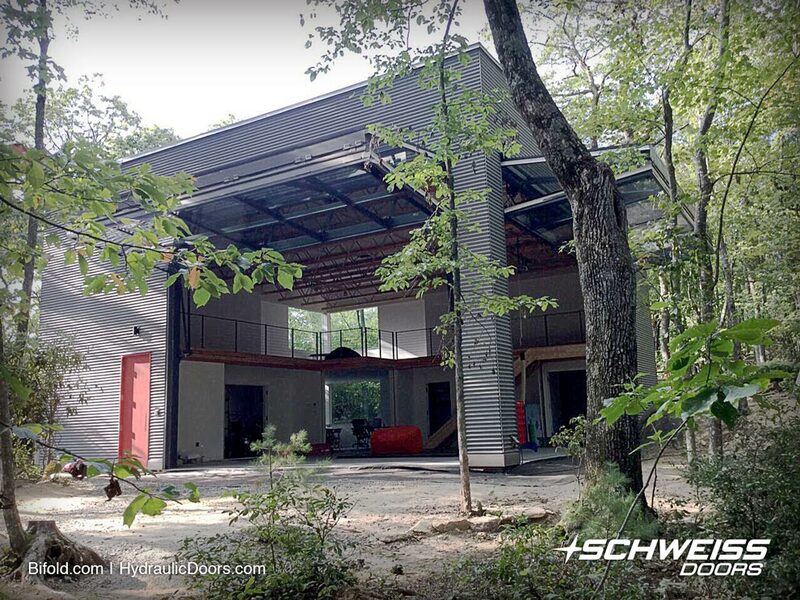 Attached to the studio are two 23'x15'2" Schweiss glass bifold liftstrap designer doors that open to the wooded area. Every architect commissioned to design a mountain location retreat, in this case, GLUCK+, based out of New York, faces a challenge of how to come to terms with the elevation, rock formations, climate, slope, trees and especially the vista. 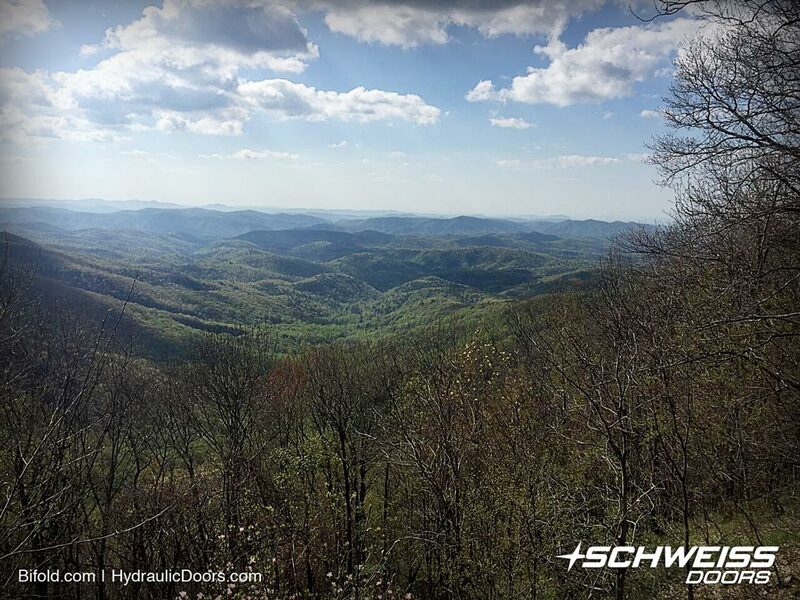 This also held true for Darrell Kennedy and his crew at Asheboro Garage Door, who were faced with the task of installing two Schweiss bifold straplift glass designer doors at the residence of an art studio in the Blue Ridge Mountains of North Carolina. The client engaged firm founder Peter Gluck and his son, principal Thomas Gluck, to create a welcoming yet unconventional retreat on a beautiful wooded site. "There was a bit of challenge, they were some very heavy doors and we wanted to preserve the wooded location without building a big construction road up to it.," said GLUCK+ architect, Kathy Chang. The art studio is located in the Blue Ridge Mountains in northwestern North Carolina. "It is a multi-purpose two-story room that can be used for a lot of things like sculpture projects, kids playing, or for a lot of things. A lot of times out of the year the weather is very nice; these big doors create an indoor-outdoor space that can really be opened up in the woods," noted Chang. "The homeowner was looking for something clean and modern with a bit of an industrial aesthetic with elements of materiality, like an exposed wood glulam beam; not minimalist, but still modern," explained Chang. "We've certainly used Schweiss Doors clad with different materials on other projects," added Chang. "The homeowner is happy with the doors, he likes the amount of glass and the fact they are motorized. It's pretty dramatic in that space." 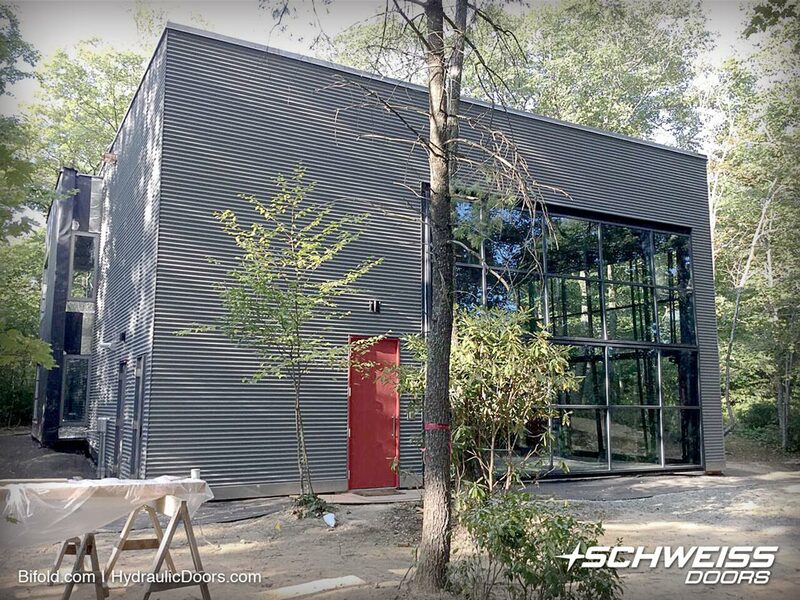 She also mentioned that Brent at Schweiss Doors helped them solve some issues due to the fact these bifold doors weren't used in an industrial space. They wanted a clean, finished look that required the doors to be customized. 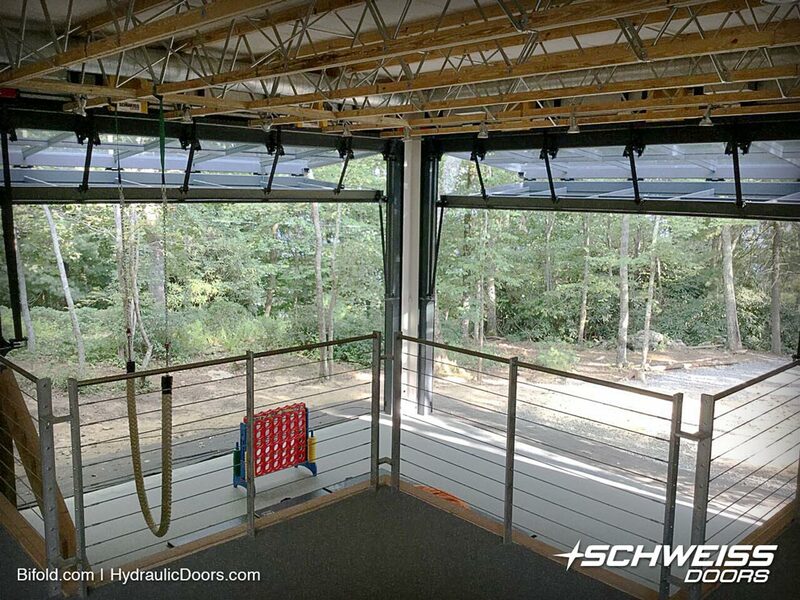 "We've installed many doors over the years for Schweiss, including one of the first hydraulic doors; and one that was over 100', said Kennedy. Jeremy (at Schweiss Doors) was a huge help in the really early stages. I'm pretty sure we were the first door company to use the new strap latch bifold door design from the factory. 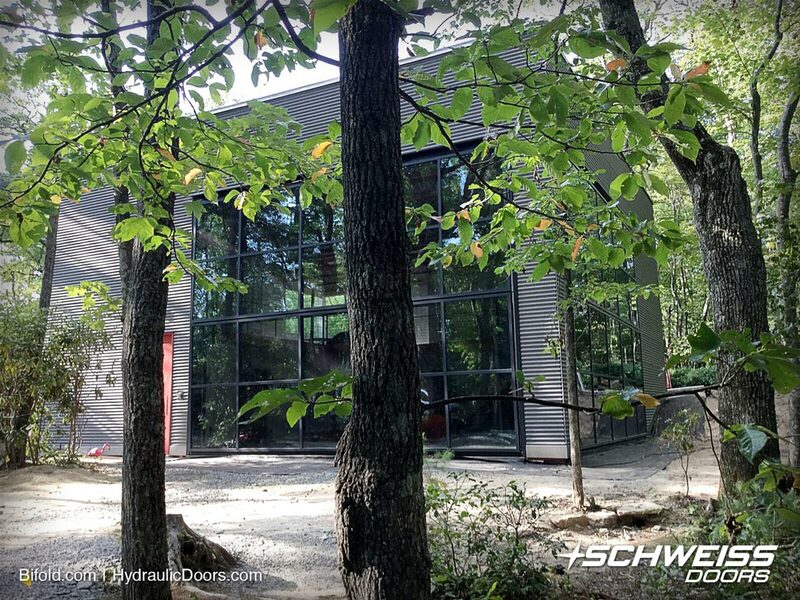 We love Schweiss Doors - they run smooth. I was a little worried about the weight of the insulated tempered glass put on them for this project, but so far no issues," said Kennedy. The large glass bifold doors give an unobstructed view of the forest outside even when closed, and they seal well against the elements year-round. These Schweiss Bifold doors are fitted with top-drive motors, black liftstraps, electric photo eye sensors and door base safety edges. Because the owner of the retreat did not want any of the trees around it disturbed, it presented a challenge in getting the Schweiss doors to the site without the use of heavy equipment. Asheboro Garage Door, owned by Darrell and Lisa Kennedy was established in 1992. For over 25 years Asheboro Garage Door has provided Residential, Commercial Garage Doors, Garage door openers, dock equipment and accessories throughout the Piedmont Triad area of North Carolina. As an authorized Clopay Dealer, Asheboro Garage Door has a wide range of products to offer their clients. Clopay provides a wide selection of garage doors with numerous finishes and options and also offers entry doors that complement the garage door. Asheboro Garage Door has continued to stay ahead of the curve and is continually adding new products to offer their customers. Retractable Screens, Structures and Awnings have been added to the product line over the past eight years. Asheboro Garage Door has installed over 50,000 Overhead Doors. In addition to installing the doors at Blue Ridge Retreat, Asheboro Garage Door has provided Overhead doors for many high profile clients. 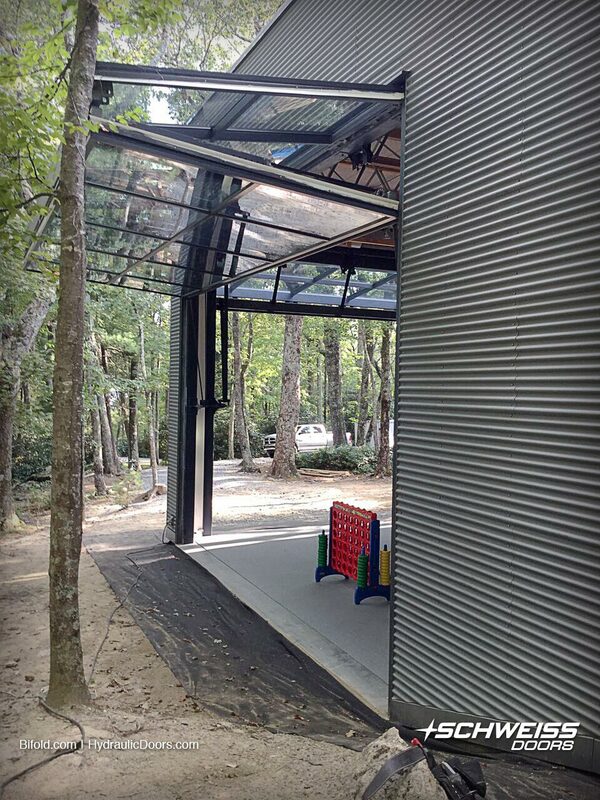 Victory Junction Camp, Richard Petty Racing, Klaussner Furniture and Dale Earnhart Incorporated are a few of the successful installs of Asheboro Garage Door. Contact Asheboro Garage Door at 1-800-521-3660. The business is located at 203 Oakhurst Road, Asheboro, North Carolina. For info visit www.asheborogaragedoor.com. Peter L. Gluck is principal of GLUCK+ (formerly Peter Gluck and Partners), an architecture firm based in New York City since 1972. Gluck has designed buildings ranging from hotels, schools, university buildings and affordable housing to churches, houses, corporate interiors and historic restorations. Many of their projects regularly win national and international design awards and have been published in architectural journals and books in many countries. Over a 40-year period, the firm has generated a multi-faceted approach to the design and construction of buildings. To acknowledge this inclusive and expanding practice, the firm was renamed GLUCK+, which builds on its approach to Architect Led Design Build (ALDB). The firm is dedicated to the idea that the architect must take responsibility for the architectural process from conception to construction assuming oversight of all aspects of design. GLUCK+ provides a wholly integrated construction management service performed by the same team who designed the buildings. This process of design and construction management completely permeates the thinking so that in cases where GLUCK+ is not the construction manager, the benefits of construction knowledge informs the designs and benefits the client. The two 23' x 15'2" bifold liftstrap doors open to the forested canopy and also provide a canopy in themselves. The opening/closing control is located 60' from the glass doors. There was a bit of a challenge in installing the heavy doors. The client insisted on preserving the wooded location without building a big construction road up to it. On a clear evening you can see the bright lights of Charlotte, N.C. located approximately 100 miles from the property and an extraordinary view of the Blue Ridge Mountains during daylight hours.